Организацијата Викиликс тврди дека актуелниот шеф на македонската дипломатија Никола Димитров во два наврати бил заштитен извор на амбасадата на САД. Според организацијата која со години објавува тајни строго доверливи дипломатски преписки украдени од американските институции Димитров бил на листата на “заштитени” во 2008 година кога беше преговарач во спорот за името со Грција. “Сегашниот министер за надворешни работи на Република Македонија Никола Димитров се води како „заштитен“ извор на американската амбасада два пати во 2008 година откако обезбедил информации за грчко-македонскиот спор за името и НАТО и ЕУ интеграциите“, пишува Викиликс. Еве го комплетните „кабли“ кои ги објавуваме со цел да остане трага дека се што се прави е одамна мислено и дека „петтата колона“ од Македонија не продала за лични интереси. 1. (C) Summary: The Macedonian leadership — PM Gruevski and President Crvenkovski — are deadlocked on how to proceed with the name talks with Greece, name negotiator Dimitrov told the Ambassador Sept. 30. UN Negotiator Nimetz will reportedly present a “take it or leave it” proposal to both sides Oct 6-7 in New York, but Dimitrov believes neither Athens nor Skopje will be able to accept it, and the talks will then likely be broken off for some time. Gruevski and Crvenkovski’s bitter feud may have softened somewhat with Crvenkovski agreeing Oct 3 to participate in an Oct 6 meeting with the major political parties to coordinate prior to the New York meetings. End summary. The Deep Freeze —————- 2. 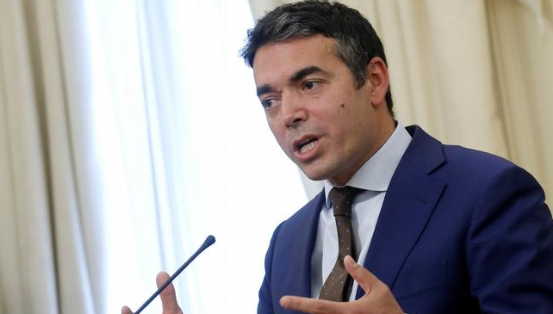 (C) The GoM’s chief negotiator on the name issue, Nikola Dimitrov, told the Ambassador Sept. 30 that President Crvenkovski and PM Gruevski are deadlocked over how to proceed with these negotiations. Dimitrov said the two have fundamentally different approaches and could barely speak to each other during a tense “coordination meeting” the previous day. The two leaders have escalated their already scathing rhetoric about each other in the press, Crvenkovski accusing Gruevski of abdicating his responsibility to pursue the negotiations seriously, with Gruevski responding that the President is essentially manufacturing a controversy to improve his political standing leading up to the end of his term this spring, after which it is expected that he will once again become leader of the main opposition party, the Social Democrats (SDSM). The tone may have improved somewhat Oct 3, when Crvenkovski announced he would participate in a meeting with the major party leaders on Oct 6 to coordinate on the name negotiations. 3. 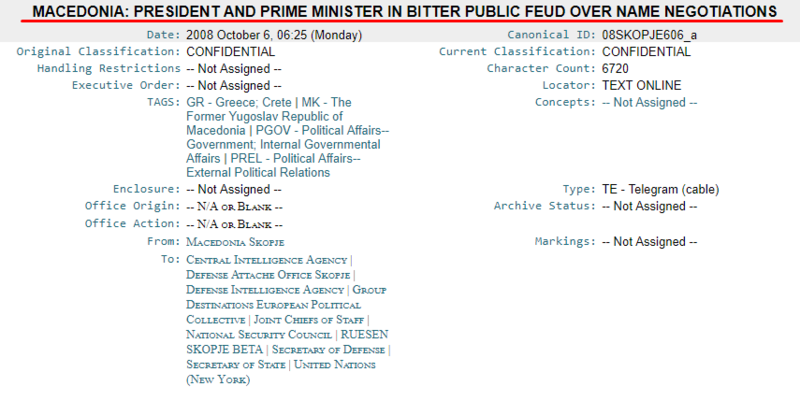 (C) These scathing press duels follow a tense week of speculation on events at the UNGA, which Crvenkovski and FonMin Milososki attended, but Gruevski did not. The PM and his advisors were furious when Crvenkovski excluded Milososki from his meeting with Nimetz, and proceeded to taunt the President, essentially daring him to come home with a deal on the name which would then be put to a referendum (the subtext being that Gruevski would ensure its failure and humiliate Crvenkovski). Dimitrov (please protect) told the Ambassador in strict confidence that Milososki had refused Nimetz’s request to meet separately during the UNGA. (While we have not sought to confirm this with Nimetz, if true this calls into question Gruevski’s seriousness in pursuing a solution.) Take It or Leave It Proposal ————————— 4. (C) Dimitrov reported that Nimetz told him that he will present a final package very soon as a “take it or leave it” deal for capitals to consider. (Dimitrov told us Oct. 1 that Nimetz has called for a meeting in New York for Oct. 7.) Dimitrov added that, according to Nimetz, Greek FonMin Bakoyannis viewed Nimetz’s latest proposal as entirely unacceptable to Greece, primarily on the issues of scope of use of a new name and the use of “Macedonian” as the adjective to describe national identity. Dimitrov had little hope that Athens would find another Nimetz proposal acceptable, and that the current political stalemate here would preclude any serious consideration in Skopje. He predicted this would lead to a prolonged pause in negotiations. In recent previous discussions with us, Dimitrov has told us that Nimetz is frustrated and confessed to be “running out of ideas.” Deep Divisions Over Macedonia’s Future ————————————– 5. (C) Dimitrov told us he believes Gruevski and Crvenkovski have a fundamentally different view of the negotiations and, more importantly, Macedonia’s future. Dimitrov portrays the President as believing the country has a bleak future if it is not a NATO and EU member, thus he believes the GoM must quickly make deal on the name in order to integrate as quickly as possible. Crvenkovski also believes Macedonia must enlist the aid of the international community in the negotiation process, and in order to do so must be seen as being willing to compromise on the name, as long as the country’s dignity and identity remain intact. 6. (C) Dimitrov sees Gruevski as more motivated by the fear of going SKOPJE 00000606 002 OF 002 down in history as the leader who lost Macedonia’s name and identity; these are more crucial than Euro-Atlantic integration. Dimitrov opined that Gruevski believes Macedonia can survive and even prosper without NATO and EU membership. Dimitrov professed to be deeply concerned that Macedonia’s e-Albanian community will rapidly become dissatisfied with the lack of movement toward these Western institutions and that interethnic tensions will rise, perhaps rapidly. Comment: A Future Without NATO and EU? ——————————————— ———- 7. (C) It is generally known that Dimitrov is closer to Crvenkovski. Following quarrels with Gruevski some months ago he has always been accompanied by Gruevski’s COS in meetings with Nimetz. It cannot be said that he is a dispassionate observer. Nonetheless, his analysis of the President and the PM’s differing perspectives is consistent with that of many other contacts. There is some evidence that the Gruevski government is laying the groundwork for preparing the Macedonian people for remaining outside the Alliance and the EU for some years to come. Among others, Milososki has made public statements to the effect that the country will thrive outside these organizations even as others in the region — Albania, Serbia, Kosovo — move forward, arguing that their membership in these institutions will also stabilize Macedonia. 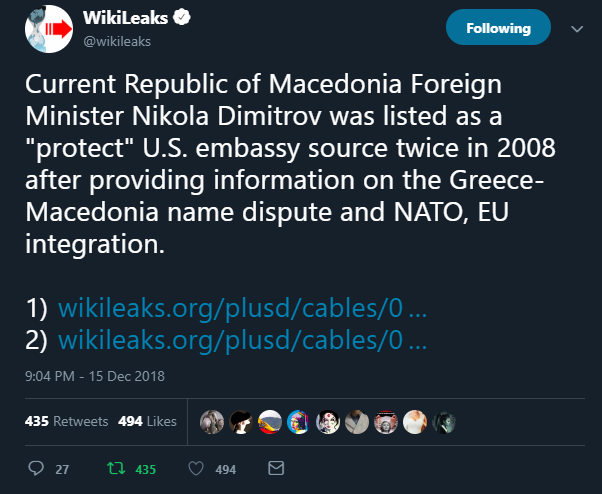 We have continued to press the point publicly and privately that Macedonia’s future lies inside these organizations; any other path will bring significant risks. 8. (C) We should not underestimate the role that political ambition and personal animosity are playing in this dispute. Since Gruevski’s VMRO-DPMNE swept to power in 2006, he and Crvenkovski have chafed under an at best uneasy state of cohabitation. With the prospect of a possible “take it or leave it” proposal on the near horizon, we are at a critical stage of this lengthy process. Вториот кабел: Classified By: Ambassador Reeker for reasons 1.4 (b) and (d). Summary ——- 1. (C) In their first official meeting, PM Gruevski told the Ambassador Sept. 29 that NATO and EU membership remain the GoM’s top strategic priorities, adding that despite their political differences he and President Crvenkovski have a similar strategic view of the name issue with Greece. Gruevski said the four cases recently returned to Macedonia from the ICTY present him with significant challenges, but so far he has managed to handle the crisis with his ethnic Albanian coalition partner, DUI, and does not seek international assistance with these cases. Gruevski also briefed on his proposal to amend the constitution to remove the 50% threshold in the second round of presidential elections. He confirmed the GoM’s plans to recognize Kosovo by mid-October, though the UNGA vote on referring Kosovo’s independence to the ICJ could push the timing a bit earlier. Ambassador emphasized the need to proceed transparently and fairly with the returned ICTY cases, and that recognition of Kosovo would be another important blow against irredentism in the region. The two also touched on Macedonia’s energy situation and other missions’ interest in new embassy projects in Skopje. End summary. A Way Forward on Name Talks? —————————- 2. (C) On Sept. 29, Ambassador presented credentials to President Crvenkovski, held meetings with PM Gruevski and FonMin Milososki, and spoke by phone with Ali Ahmeti, leader of the largest e-Albanian party, DUI. The meetings with Crvenkovski and Milososki were largely protocolary. DCM and P/E Chief accompanied Ambassador to his meeting with the PM, joined by Gruevski’s Chief of Staff, Martin Protoger. PM Gruevski assured the Ambassador that he and Crvenkovski are reasonably close in their positions on the name negotiations with Greece, asserting that their main difference is on what public stance to present on this issue. He criticized Crvenkovski for being too willing to reveal Macedonia’s bottom line to the press. Gruevski said he is willing to tell us and UN negotiator Nimetz what his bottom line is: preservation of Macedonia’s people and language as “Macedonian,” similar scope of use to what is now used for FYROM (i.e., in international fora, not bilaterally), and a geographic modifier to the name itself only in “brackets” (i.e., parentheses). (He also made a strong plea that the U.S. not change its recognition of Macedonia under its constitutional name.) Should these views be revealed in public, he asserted, Greece will simply pocket these as concessions and use this position as a new starting point. (Subsequent to our meeting, Gruevski and Crvenkovski held dueling press conferences, accusing each other of failing on this issue. The GoM’s name negotiator, Nikola Dimitrov (protect), told us that there is no consensus between Crvenkovski and Gruevski on how to proceed with these talks–more septel.) 3. (SBU) Gruevski emphasized that Macedonia’s top strategic priorities remain NATO and EU membership. He understood that the European Commission was not likely to recommend offering a date for opening formal membership negotiations to Macedonia, and would likely cite the conduct of June elections and shortcomings in administration and political dialogue as the reasons. However, he added, “the real issue is Greece.” Returned ICTY Cases: A Major Challenge ————————————– 4. (C) Gruevski reported that the four war crimes files recently returned from the ICTY likely present him with the greatest challenge in relations with his coalition partner, DUI, that he will face in his mandate. He reported that the Chief Prosecutor (CP) has confirmed that the 2002 amnesty law does not apply to these cases, and that ICTY Prosecutor Brammertz had also told the CP this. Yet Gruevski understood the serious political risks these cases present to DUI and, by extension, to his coalition. He believed that he and DUI had reached agreement on how to proceed in the near term (i.e., October), but admitted that more challenges lay ahead. Gruevski emphasized that, for now, he was able to work well with the DUI leadership on this issue, and said international assistance with these cases was not now necessary. Ambassador responded that strong SKOPJE 00000601 002 OF 002 leadership requires hard choices. He urged Gruevski to work not to inflame inter-ethnic tensions, and that the proceedings in these cases must be transparent and fair. Maneuvering on Presidential Election Changes ——————————————– 5. (C) Gruevski briefed the Ambassador on his proposal to amend the constitution in order to remove the 50% threshold required in the second round on presidential elections. He admitted that in the past the authorities have had to resort to ballot stuffing (without changing the actual winner) in order to reach the threshold, and asserted that unless this rule is changed there is a “95% chance we will have unsuccessful presidential elections next year.” Time is of the essence, he added, since it takes about three and a half months to amend the constitution (presidential elections are due in spring 2009). Ambassador responded that we understood his predicament, and that we do not support DUI’s proposal in recent days to have the parliament elect the president. This would be a step backward for Macedonian democracy. Kosovo Recognition Coming ————————- 6. (C) Gruevski confirmed that Macedonia still plans to recognize Kosovo in October, along with Montenegro and possibly Portugal (reftel). However, he added, the Serbs have now told the GoM that recognition after the UNGA vote on Serbia’s proposal to take Kosovo’s independence to the ICJ would be a serious blow. He said he would call PM Djukanovic the same day or the following day to ask him to move faster. He reiterated his request that we not discuss this issue publicly prior to GoM action, and his intention to recognize by mid-October, with or without Podgorica. Irredentism ———– 7. (C) Ambassador underscored that the executive and legislative branches of the U.S. government firmly oppose irredentism. The U.S. recognized and supported states, including Macedonia, Greece, and Kosovo, within their existing and agreed-upon borders. This is an essential component of stability. The U.S. would oppose irredentism whether in North America or in the Balkans or anywhere. PM Gruevski indicated his agreement. Energy: No Business as Usual with Russia —————————————- 8. 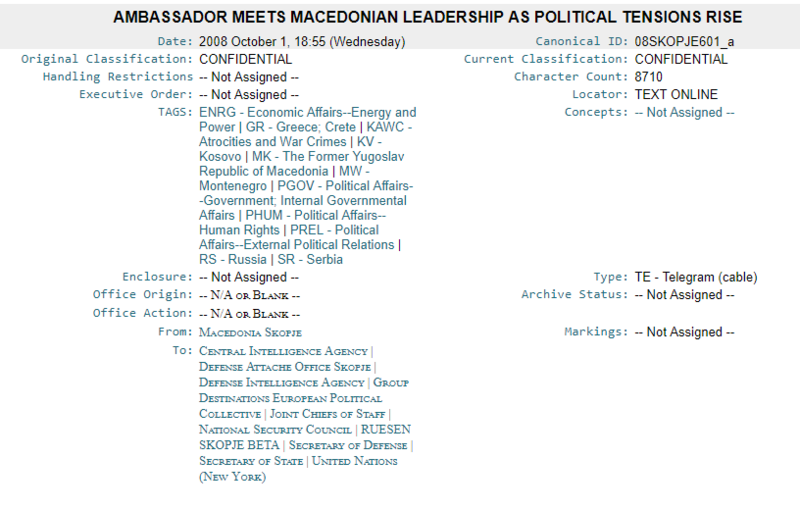 (SBU) Ambassador suggested that he and the PM agree to discuss further Macedonia’s energy situation. While we understand Macedonia’s reliance on Russian gas, high-level contact (such as a Gruevski visit to Moscow) would not be advisable given the Georgia situation. Gruevski understood this, noting that the Russian ambassador here told him that the GoR is “always ready” for him to visit Moscow: “They want to use us,” Gruevski opined. The PM added that Macedonia pays a significantly higher price for Russian natural gas than the other countries in the region: 420 Euro/1000 cubic meters, as opposed to 220-300 Euro in Serbia, Bulgaria, Bosnia, and Montenegro. Ambassador inquired as to the status of potential uranium mines in Macedonia (which Gruevski had mentioned when he and the Ambassador met informally in New York over Labor Day weekend). Gruevski replied that these still required exploration. Should this proceed to exploitation, the GoM would need to decide whether to pursue development by a state-owned enterprise or to open it up to private competition. Chinese interest in New Embassy site ———————————— (C) Gruevski mentioned that the Chinese Ambassador asked FM Milososki for assistance in acquiring a large (100,000 square meters) piece of land in the Kale area of Skopje, making clear that they have in mind the parcel adjacent to our new embassy, and also noted Russian interest in new construction as well. The Ambassador asked Gruevski to hold off on selling that land to the Chinese until he has a chance to consult with Washington.